The garnet is a silicate. This family of minerals shows different colors but the most common one is the red one. The name of this stone comes from the Latin word "Granatus" which means "with seeds". This name would have been given around 1270. It is possible that it was a reference to the pomegranate. The seeds, the size, the shape and the color are almost identical to the stone. 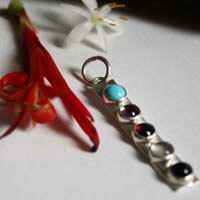 The different varieties of garnets show almost every color, except the blue one. The stones with brown, red, green, yellow, black and colorless stones are quite common. It is an important stone in the history because it is more common than the sapphire or the ruby, but also because it was not only used for decoration. It is a strong stone. It was used to engrave other stones such as agates, jaspers… people used to make an abrasive powder of it to polish and cut these stones. It is still used that way today to cut precisely with a water jet or to stick on sanding paper. This stone has been used a lot since the Bronze Age, mainly in Czechoslovakia where you could find the main mine of pyrope garnet. Archeological findings show that it was also used in the Antique Egypt. 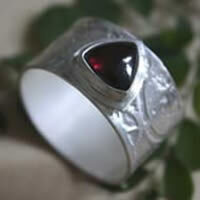 The red garnet was commonly used on the pharaohs' clothes and would accompany them to the tumb. The garnet was particularly used for the war goddess Sekhmet, the woman with a lion head who would show a solar disc. Sumerians would use it around 2100 BC to decorate stones. 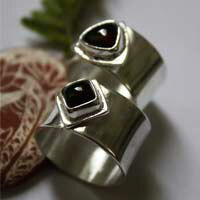 Other traces of garnet were found in Sweden, between 2000 and 1000 BC. The Greek Theophase (-372, -287) already mentioned the garnet and he would call it anthrax or "coal". Greek people thought that it would give the power to see at night time. The Roman Pline the old described it. He also named it "almandin carbunculus" or burning coal as a reference to its color. 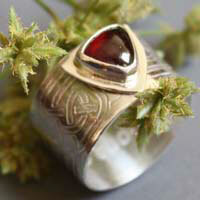 Celt people commonly used the garnet in their jewelry and their weapons in order to be courageous and to be protected. In the Hebrew Talmud, it is said that Noah’s arch was enlightened by a big garnet. The stone used to be called Bareketh, "blinking stone" or Barak "thunder". According to the Bible, Aaron’s clothes were decorated with a garnet. During the Middle-Ages, people thought that the garnet would allow increasing one’s faith as well as avoiding melancholia. Therefore, Crusaders would wear it to give them faith and courage when fighting the enemy. It was also used as a medicine against the inflammations and the plague. 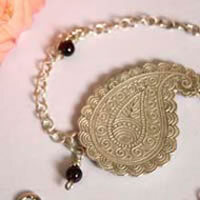 Arabian leaders would always wear garnets that would symbolize sincerity. In the Koran, the fourth sky would be composed of carbuncles (or garnet). 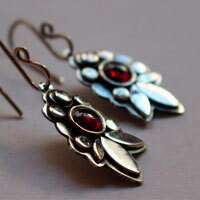 The garnet is also considered as a sacred stone by a lot of American Indian tribes. You can also find it in the Aztec and Mayan cultures. 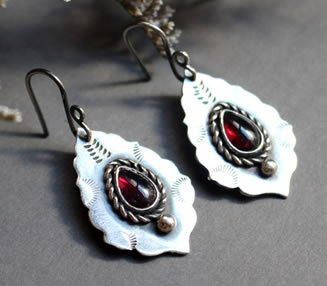 In the Amerindian tribes of the North, the garnet was often used in jewelry, decoration and dream catchers. They would consider that the stone would allow revealing what was hidden. In a lot of traditions, the garnet is associated to blood because of its common color. It is the case in Asian tribes who would consider that it would protect them against injuries. Moreover, they would also think that it was even more dangerous used as projectiles. Therefore it was quite common to use the garnet as arrow heads or as bullets. It is the case for the Hanzas who used this projectile against the British troops during their 1892 rebellion on the Cashmere boarder. In India and in the Far East, it was used as an amulet against poison and the plague, as well as giving health and cheerfulness. 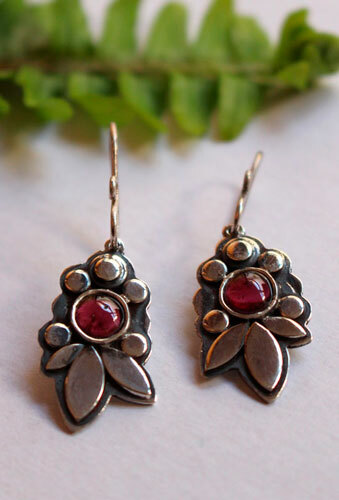 According to popular beliefs, the garnet would protect from injuries and poison, it would help stop bleeding, it would symbolize truth and fidelity and would bring richness. It is above all the semiprecious stone that has been traditionally used by jewelers for the month of January. Mines: Italy, Brazil, Tanzania, the USA, and Sri Lanka. It would be the stone of health. It would delay aging and regenerate the skin. It would then help with rheumatism and arthritis. The garnet would be efficient to cure injuries and hemorrhages. When touching the injury, the garnet would help the blood to coagulate. It would balance sexuality. It would also allow reducing libido. 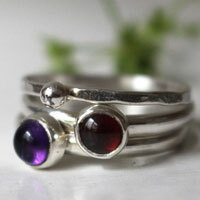 The garnet would help having healthy bones. It would regulate the thyroid and would activate the heart. It would be useful in case of inflammation, anemia, and blood problems. It would reduce toxins in the body in order to purify organs and the blood.